Pope Pelagius I (died 4 March 561) was Pope from 556 to his death in 561. 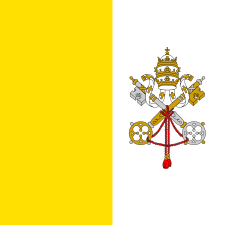 He was the second pope of the Byzantine Papacy, and like his predecessor, a former apocrisiarius to Constantinople. He came from a Roman noble family. 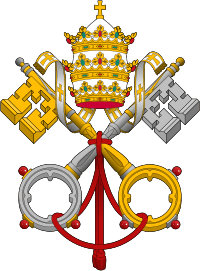 His father John seems to have been vicar of one of the two civil "dioceses", or districts, into which Italy was then divided. Pelagius accompanied Pope Agapetus I to Constantinople and was appointed by him nuncio of the Roman Church to that city. When Pope Vigilius went to Constantinople on the orders of Emperor Justinian I, Pelagius stayed in Rome as the pope's representative. Totila, King of the Goths, had begun to blockade the city. Pelagius poured out his own fortune for the benefit of the famine-stricken people, and tried to induce the king to grant a truce. Though he failed, he afterwards induced Totila to spare the lives of the people when he captured Rome in December 546. Totila sent Pelagius to Constantinople in order to arrange a peace with Justinian I, but the emperor sent him back to say that his general Belisarius was in command in Italy. Traditionally, he is credited with the construction of the Santi Apostoli, Rome, built to celebrate the complete victory of Narses over the Ostrogoths. Pelagius was elected Pope as Justinian's candidate. While before his ordination he opposed Justinian's efforts to condemn the "Three Chapters" in order to reconcile theological factions in the Church, afterwards Pelagius adopted Justinian's position. 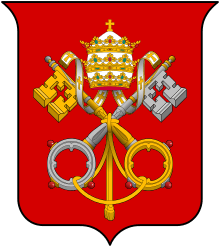 This damaged the papacy's reputation in northern Italy, Gaul, and elsewhere in Western Europe, and his successors over the next 50 years spent much effort undoing the damage. ↑ Mann, Horace K. (1911). "Pope Pelagius I". In Herbermann, Charles. Catholic Encyclopedia. 11. New York: Robert Appleton Company. Wikimedia Commons has media related to Pelagius I.